pompii is a bad place to live because people were killed because of the voalcanoa. Oh really , well before u say that why not check the disgusting crimes that this city was full of. FORGRT YOULL LOL JK (NOT REALLY) SIKE YA!! You people are stupid. Pompeii is a very historic place and i would do anything to see this place. Pompeii has a volcano called mount Vesuvius. personally i think pompeii is a nice place to live. and i think awesome guy”_ _ _ _ s”,and awesome guy should be thrown into complete a bis. Hey there! Somebody in my Myspace group shared this site with us so I got here to take a look. I’m positively having fun with the information. I’m bookmarking and shall be tweeting this to my followers! Exceptional weblog and excellent design. done. Will you cirlce back to this while in the long term? The ash and stones,tells the story of the strichen city pompeii. But Pompeii is a forgotten city because of the massive volcano eruption. I’d like to explore the wonderful beings of this forgotten city or whatever. BUT I LOVE IT SO MUCH! 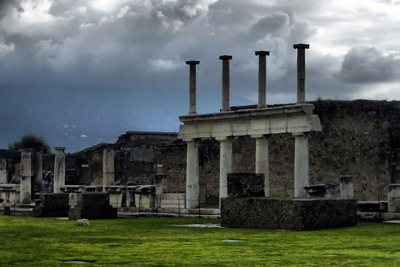 I am doing research about Pompeii because I am going there in three days and I can’t wait! I live in Italy, and am homeschooled so I can see all these cool places everybody dreams about going to. What happened to Pompeii is really sad, but I think it is a very historical place that I can learn a lot from.